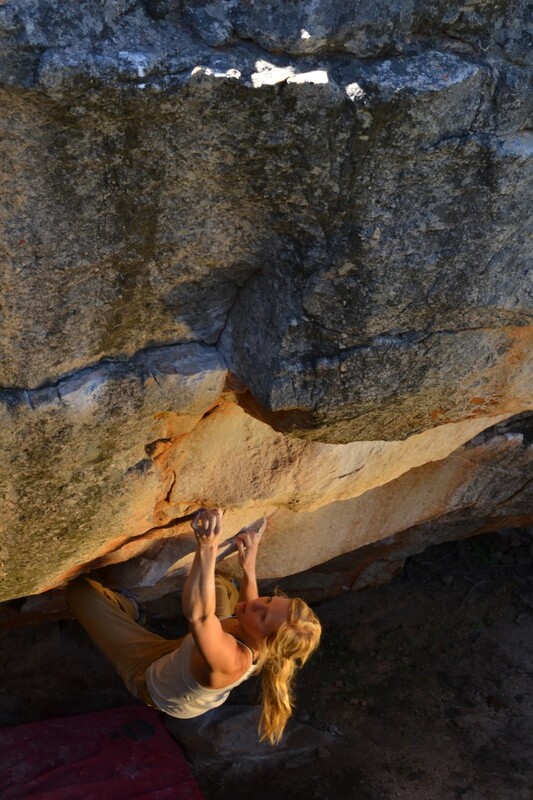 What do you understand by trying hard: training for a climbing trip or getting up early to try your project? Going out in the rain to find dry rock, embarking on a tenth session or buying the shoes that you know will work on that move? Or are we talking about something more specific: that split-second moment when you should be falling off but you dig deep – somewhere hidden and not often called upon – and for a moment you think nothing, see nothing, experience nothing. But you’re still on the rock. Are you really trying hard when you climb? Are you pushing as far as you possibly can? Do you have the capacity, the energy and the motivation? I’m talking about something past what one first thinks of as trying: a new level; an indefinable concept of effort. It’s a factor entirely dependent on the capacity of the individual. Take Adam Ondra’s primal screams of effort or Chris Sharma’s roars of power – both of them, I believe, know the depths of what I am talking about. So is it natural or learnt? Do some people just know how to go there while some linger on the outskirts, unable to break down their barriers? I believe we can all go there if we want to, if we realise that there is an arena into which we have not been, if we are explorers and we are willing to take it on. My memory of finding this tool – and a tool it is, not to be over-used, but applied in force when needed – lies with one boulder problem. It was freezing cold and I was tired, but my motivation was high, my hunger to achieve insatiable. I had fallen over 20 times on the last move, over a handful of sessions including the one I was immersed in. I felt like I had learnt to fall there, it was part of my sequence now and I didn’t know how to combat it. But I really wanted to. Funny, how some of life’s best lessons are learnt in moments of relative desperation. I don’t know what was different on the go I held the move. I don’t remember much except that I experienced a sort of ‘blank’ moment and I heard a low, guttural noise that I later realised had originated from somewhere deep within me. I had knocked down a barrier, mental and physical, and I knew it then: I felt a palpable growth in my potential, just in that moment. I had accidentally found and understood something about myself and my limits, something precious and also overwhelming. The enemy of this ability, this tool, as with many things in life, is fear. When you put everything you have into something, utterly and completely, there is no room for pride, ego or, even, shame. You are opening yourself up to a new level of failure – a complete failure with no excuses or reasons. If you harness this tool, you will inevitably face this kind of failure where you have held nothing back, but you are still not good enough. Be aware of this risk, this potential pain, but be inspired by how much you can achieve by digging deep, by finding that last grain of power and pushing it to the surface. Your horizons will widen, your understanding of your limitations will expand and your successes will mount up. This lesson was a turning point for me: a realisation of what trying really means, of how far I could push and what I could achieve. I learnt to tap into a reserve that I didn’t know existed and it fuelled me forwards in my climbing. How far could you go if you really, really tried? Spot on, Mina! Congrats on the send! I think females especially have a difficult time giving their all when it comes to physical challenges. It’s inspiring to see women truly trying hard in what ever they choose to attempt! What’s the point otherwise?! This is great, definitely going to read this before I climb from now on. I struggle with pushing myself and this taps into what I care about. Can’t wait to try it!